Mathematics courses have been found to be the most significant barrier to degree completion for all fields of study. Long sequences of developmental math and a perceived lack of relevance to degree and career plans contribute significantly to this barrier. Research shows that students who complete a college-level math course within their first academic year are more likely to earn a postsecondary credential. 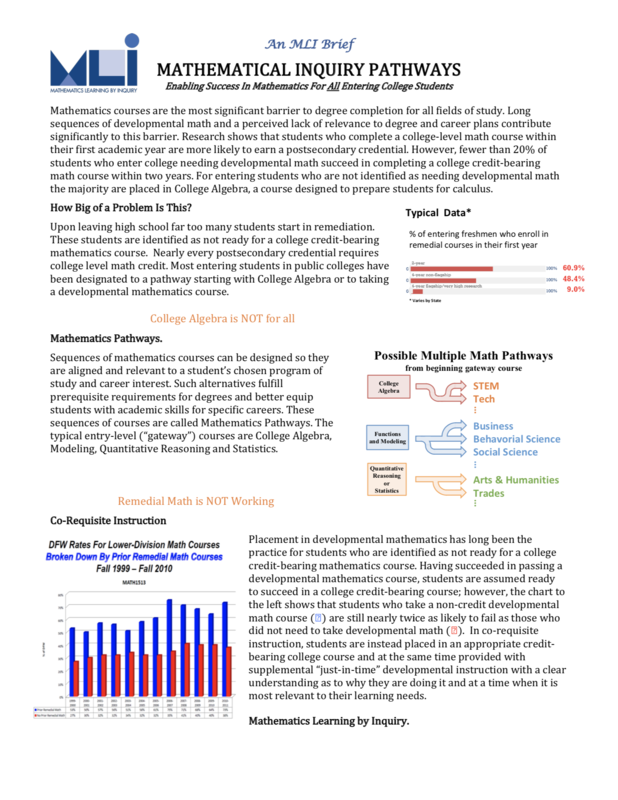 However,fewer than 20% of students who enter college needing developmental math are succeeding to get a college credit- bearing math course within two years; and for those who are not identified as needing developmental math are succeeding to get a college credit-bearing math course within two years; and for those who are not identified as needing developmental math the majority are placed in College Algebra, a course designed to prepare students for calculus. Upon leaving high school and entering a 2-year college approximately 60% of all students test not ready to succeed in a college credit-bearing mathematics course. 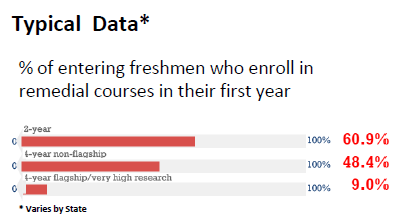 For those entering 4-year public colleges it is not much better with over 48% testing not ready for a college credit-bearing mathematics course. Nearly every postsecondary credential requires college level math credit. Most entering students in these public colleges have been destined to a pathway starting with College Algebra or of taking one, two, or sometimes three developmental mathematics courses, none of which gain college credit. Fewer than 10% of students starting in College Algebra every take Calculus I and of those fewer than 10% successfully complete Calculus I. College Algebra is NOT for all. Sequences of mathematics courses can be designed so that they are aligned and relevant to a student’s chosen program of study and career interest. Such alternatives fulfill prerequisite requirements for degrees and better equip students with academic skills for specific careers. These sequences are called Mathematics Pathways. Typical entry-level courses for these pathways with some variation of title are College Algebra, Modeling, Statistics, and Quantitative Reasoning. There also is benefit to include courses in Preparation for Calculus and Calculus I. While purpose (mathematics for specific degrees and careers) is a significant component in the placement of students, it alone does not answer student readiness. For nearly half the students who start with a remedial math course it is their first and last postsecondary course and for those who go on for a college credit-bearing math course, typically 70% do not succeed. Remediation in mathematics is NOT working. Developmental mathematics has been the practice for students who are identified as not ready for a college credit-bearing mathematics class. Having succeeded in passing a developmental mathematics course, students are assumed ready to succeed in a college credit-bearing course; however, the chart shows that these students who take developmental math are nearly twice as likely not to succeed as those who did not need to take a developmental math course. Developmental math does not prepare the majority to succeed. In co-requisite instruction, students who are identified as not ready for a college level credit-bearing mathematics course are placed in an appropriate college level course and provided supplemental “just-in-time” instruction. They receive the necessary developmental work with a clear understanding as to why they are doing it and at a time where it is most relevant to their need. To improve student course success, college retention, and degree completion, both math pathways and co- requisite instruction provide solid structural foundations for alternatives to recognized barriers. However, these structural changes expose the need for change in both teaching and learning; specifically, these changes call for more active student engagement in their learning, more applications of mathematical concepts being studied that are relevant to degree and career objectives, and more attention to building academic success skills in gateway math courses. Mathematics Learning by Inquiry employs a focusing definition of mathematical inquiry that mirrors these needs. We frame mathematical inquiry in terms of optimizing learning in mathematics classrooms through 1) increased use of active learning techniques, 2) incorporation of relevant applications of mathematics, and 3) development of broader academic success skills. The MIP adapts existing proven models for empowering mathematics faculty to develop the expertise to support and effectively implement research-based reforms, while also developing the ownership and capacity necessary to implement and disseminate them at scale. What are Mathematical Inquiry Pathways? 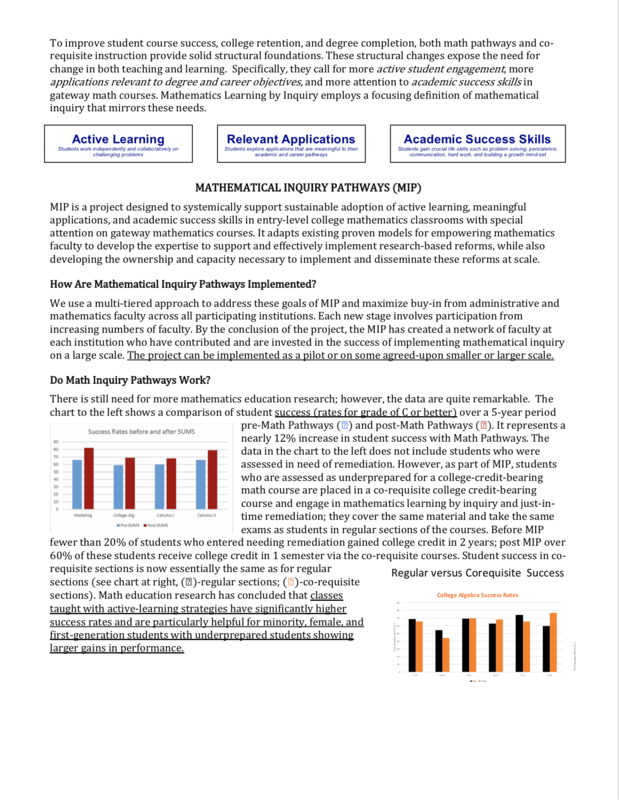 The Mathematical Inquiry Pathways is a project designed to systemically support sustainable adoption of active learning, meaningful applications, and academic success skills in entry-level college mathematics classrooms. How are Mathematical Inquiry Pathways Formed? We use a multi-tiered approach to address these goals and maximize buy-in from administrative and mathematics faculty across all participating institutions. Each new stage involves participation from increasing numbers of faculty. By the conclusion of the project, the MLI-MIP has created a network of faculty at each institution who have contributed to, and are thus invested in, the success of efforts to implement mathematical inquiry on a large scale. The project can be implemented as a pilot or on some agreed upon smaller scale. Principal Administration and Faculty Visits. Representatives of the MLI-MIP Team visit with administrative and mathematics faculty representatives from the participating institutions. Initiation Workshops: The MLI-MIP Team will publicly launch with (4-day) Initiation Workshops with mathematics faculty from participating institutions for each of the identified entry-level mathematics pathway courses along with one Workshop for Academic Success Skills. The faculty participating in these workshops will produce prioritized lists of concepts and skills for each course, including their co-requisite supports, with detailed learning trajectories and resources to be used in further development work. Collaborative Research and Development Teams: The MLI-MIP Team will organize and support Collaborative Research and Development (CoRD) teams, each consisting of 2-3 faculty to develop instructional modules for the core concepts identified in the Initiation Workshops for each of the selected courses. After peer review and revision, the modules will be shared and supported by workshops and mentoring. Implementation Workshops: In the next stage, the MLI-MIP will foster full-scale faculty development by conducting single-day Workshops, each engaging faculty in implementing modules led by members of the respective CoRDs. Faculty members develop distributed leadership to support widespread incorporation of inquiry in college mathematics instruction. 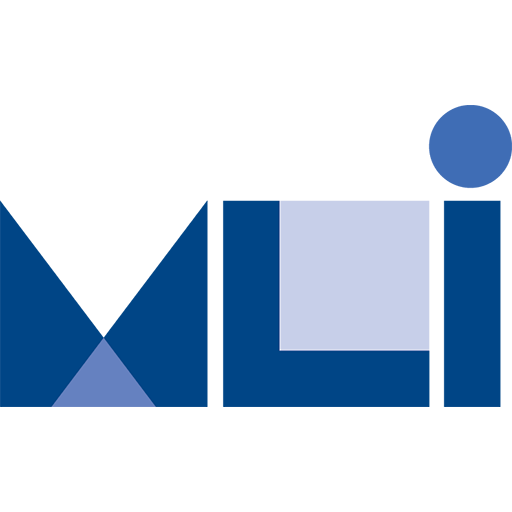 Faculty Peer Mentoring: Finally, the MLI-MIP will support semester-long peer faculty mentoring relationships between one emerging leader and other faculty to support the faculty’s implementation of MIP resources in a class they are teaching. Faculty members will reinforce and support cultural practices of teaching mathematics through sustained interpersonal interactions. Research and Evaluation: Project personnel document the evolution of the Community of Practice, evolution of individual faculty, and impact on student success and produce a refined model for developing and sustaining an effective system-wide faculty Community of Practice. Does Math Inquiry Pathways Work? There is still a need for more mathematics education research; however, the data is quite remarkable. The chart to the left shows a comparison of lack of success (DFW rates) over a 5-year period pre-Math Pathways and post-Math Pathways. It represents a nearly 12% increase in student success. There are no students in this group that were assessed in need of remediation; however, there may have been some who had taken developmental math prior to taking these courses. Now, as part of Math Inquiry Pathways, students who are assessed as not prepared for a college-credit-bearing math course are placed in such a course and provided “just-in- time” supplemental instruction as well as engage in mathematics learning by inquiry; they cover the same material and take the same exams. They are realizing success at essentially the same rate as those who were assessed ready. In this study, there had been fewer than 15% of students who entered having had developmental math passing a credit-bearing college course in two years; with the MIP over 70% are getting such a college credit in just one semester and they did not have to take a developmental math course. Math education research has concluded that classes taught with active-learning strategies have significantly lower failure rates are particularly helpful for minority, females, first-generation and underprepared students.